If you have never heard of lychees, you should look for a canned variety on your next trip to the supermarket. Their soft, sweet flesh is delicious and refreshing and their delicate flavor can enhance so many desserts. Most large supermarkets should carry canned lychees, and if you are in close proximity to an Asian market, then you should be able to find the fresh lychees in their shell in the produce department. In case you can’t find canned lychees in your area, you can always order online here (affiliate link). 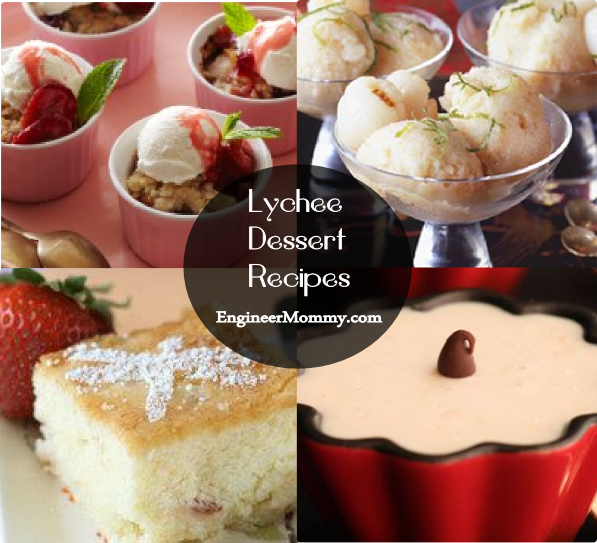 Check out this list of delicious lychee dessert recipes! Brimming with fruits, this apple, lychee and raspberry crumble dessert is sure to tantalize your tastebuds! Stay cool in the warmer weather with this lychee & lime sorbet recipe! Rich and moist, this lychee butter cake is a sure winner! Serve up this exotic lychee pudding at your next party and your guests will never guess it was such a simple recipe!